The church: Christ the King, Gordon Square, Bloomsbury, London WC1. 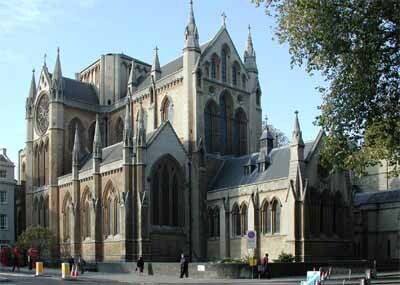 The building: Gothic Revival church designed by Raphael Brandon in 1853 for the Catholic Apostolic Church. Then used by the University of London and now by the Forward in Faith movement of the Church of England. The church: Does not serve a local community as now used by the Forward in Faith movement of Church of England. The neighbourhood: University buildings are in the immediate locality. The cast: Principal celebrant: the Bishop of Fulham. Preacher: the Bishop of Ebbsfleet. Pontifical benediction: the Bishop of Wangaratta. Mass for Christ the King 2001. One-fifth full. About 150 congregation and about 30 concelebrating priests. No. I was just handed a service leaflet. Bench pews. I sat in the back row and mine was the only row with cushioned seats  so I was quite comfortable. The kneeler was well padded, with plenty of leg room. Quiet, except for the choir in practice. "In the name of the Father," etc. Hymn sheet only, with a few additional service notes. The organ, which was superbly played by Fr. Mark Elliot Smith. And the choir, who had superb voices. Benediction did not come over the speaker system very well. 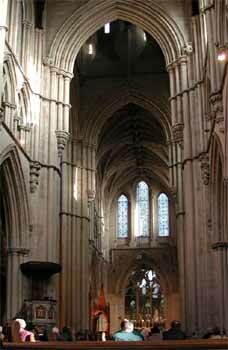 High Anglo-Catholic, with incense and the procession of the blessed sacrament and benediction. 7  Academic but designed for "believers". It was based on "Jesus, remember me when you come to your Kingdom." The bishop divided Christians into three types: 1) Those who believe that we can worship God by simply loving our neighbour. 2) Those who believe that the word is everything. And 3), those who believe that the liturgy is where Christ is enthroned. However, he said that "true Christianity" is proclaimed when all three are held together. The superb choir was a joy to hear. There was also a lady who came and sat next to me who had a beautiful and well trained voice. I have been to this service a number of times over the years and I do wish someone would clean and polish the thurible. I'm afraid that looking lost here invites being ignored. Wine was available, but by nearly 2pm I was getting a bit peckish and decided I must find some lunch. 2  Not an option, as this church does not cater for Sunday masses. There are weekday services for those in central London. Yes, the congregational singing was rousing and joyful. It was also good to be with a group of like-minded Christians. The quality of the singing by the choir.